The famous “Flying Flapper of Freeport” who gained notoriety by flying a Waco 9 biplane under all four of New York City’s East River bridges on a dare during the Golden Age of Aviation in 1928, passed away March 19th. 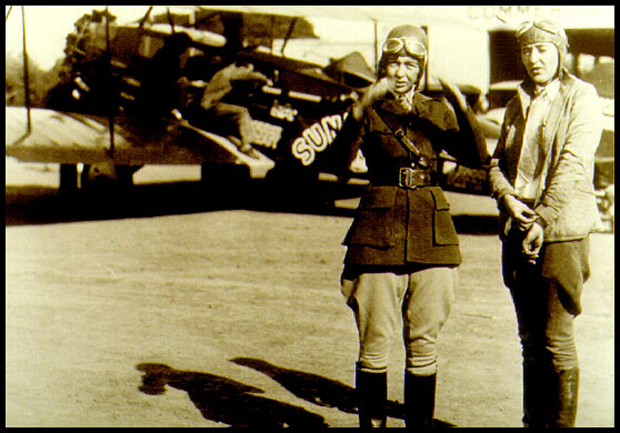 Elinor Smith, born, Elinor Regina Patricia Ward on August 17th, 1911, was an ambitious, record-breaking female pilot during the 1920’s and ‘30’s. Smith grew up in Freeport, Long Island, and received her first flight experience at age 6 from French pilot Louis Gaubert of Hicksville in his Farman Pusher Biplane. She continued riding with Gaubert during the summer, and when she was 10 years old, she began what would be six years of flight instruction before her first solo at age 15. Three months later she achieved an unofficial women’s light aircraft altitude record, flying her father’s Waco 9 to 11,889 feet above the earth. 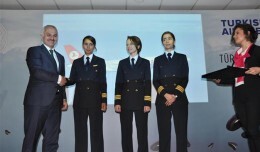 Shortly after her 16th birthday, she became not only a licensed pilot, but the youngest licensed pilot on record. On October 21, 1928, just over two months after her 16th birthday, several male friends dared her to fly under the four bridges (Queensborough, Williamsburg, Manhattan, and Brooklyn) of the East River. She planned her feat carefully, as if preparing for an Olympic event, and moments before she took off received a pat on the back from Charles Lindbergh, who said to her, “Good luck, kid. Keep your nose down in the turns”. Following her successful maneuverings, word got around quickly and her license was suspended for only 10 days by the U.S. Department of Commerce, thanks to the intervention of insightful and merciful New York City mayor, Jimmy J. Walker. In 1929, Elinor Smith toured the U.S. airshow circuit, piloting a Bellanca Pacemaker for a group of parachutists promoting the Irvin Parachute Company as the company’s first female executive pilot. In the same year, she broke 4 records. In January 1929, she set the women’s solo endurance record flying an open cockpit Brunner Winkle Bird for 13 hours and 16 minutes over Roosevelt Field, breaking Bobbi Trout’s 12 hour and 11 minute endurance record. After Louise Thaden exceeded Elinor’s record, flying 22 hours and 3 minutes on the west coast near Oakland, CA, in March 1929, Elinor once again took to the skies, flying 26 hours and 21 minutes in a Bellanca CH monoplane. Teaming up with Bobbi Trout, Elinor and Bobbie set the first official women’s record for mid-air refueling endurance, staying aloft 42 ½ hours in a Sunbeam biplane. Also, in 1929, she broke a women’s speed record flying 190.8 mph in a Curtiss Falcon, and at 18 years old, was the first woman to pilot a military aircraft and first 18 year old male or female receive a transport pilot’s license. 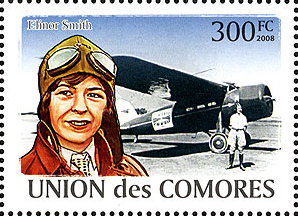 In 1930, Smith was named Best Woman Pilot in America, earning the honor by popular vote. Elinor broke a world altitude record by a mile in 1930, flying to 27,541 feet. Both Bellanca and Fairchild Aircraft companies hired her as their first woman test pilot. In March 1931, Elinor flew Bellanca’s six passenger airplane to a record-breaking altitude of 32,576 feet over Roosevelt Field. Elinor continued flying as a stunt pilot in movies, airshows and fundraisers for the homeless as the Great Depression gripped the nation. In the interim, she met Patrick Sullivan, a New York state legislator and attorney, and married him in 1933. 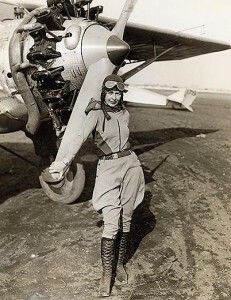 In 1934 she became the first woman pilot featured on a Wheaties box. She soon retired from flying to raise their four children. After 23 years of marriage, her husband passed away, and she began flying again. As a member of the Air Force Association, she was given the opportunity to fly the T-33 Shooting Star (T-Bird) and the C-119 Flying Boxcar. 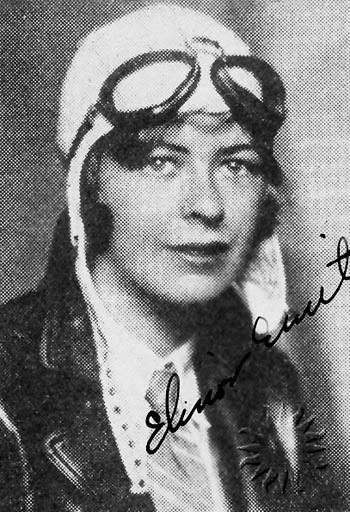 In 1981, Elinor published her autobiography, Aviatrix. In March 2000, she became the oldest pilot to succeed in a simulated shuttle landing, acting as pilot with an all–woman crew on NASA’s Space Shuttle vertical motion simulator. She was given the opportunity to fly the experimental aircraft, the C-33 Raytheon AGATE, Beechcraft Bonanza at the age of 89 from NASA’s base at Langley AFB, Virginia in April 2001. In her later years, she lived in Santa Cruz, passing away at a nursing home in Palo Alto on March 19, 2010. Our culture has not caught up with its own ideology yet (i.e. letting women “have it all”), but I will firmly state that it’s headed in the right direction. That was a great article! Great work Julie! I enjoyed your article on Elinor Smith. She should have been a household name. It's sad that she only received some press when the movie "Amelia" came out and now when she has passed away. She was only known in aviation circles before. But she trule was a pioneer in the field of aviation. I am preparing a dramatization/power point presentation about Elinor and also about my Aunt Victorine Florsheim Lederer who was a pilot in the 30's. There were so many gifted woman pilots but the public only knows Amelia. Thank you for writing this informative article about a really great woman.